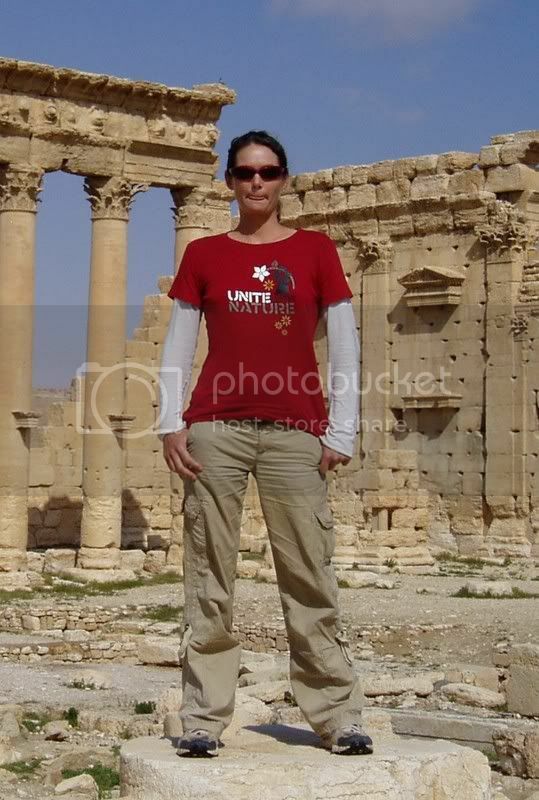 My sister, Jacqueline "Nicole" Vienneau, a Canadian tourist, disappeared in Syria on Saturday, March 31st, 2007 at the age of 32. She was in her fifth month of a six-month solo adventure through West Africa and the Middle East. She was last seen by the desk clerk at 8:30 in the morning as she left the Cairo Hotel in Hama, two hours north of Damascus. She definitely intended to return to the hotel as her backpack was left in her room along with the memory cards from her camera, full of photos. She also left her journals that include an entry made the night before she disappeared. Canadian police retrieved her Hotmail account email records indicating she attempted to login around 8:30 Friday night but was unable to (Syrian Internet connections are not reliable). Her last completed emails were sent Thursday night. Nicole's guidebook was also left in her room. In the back of her Lonely Planet "Middle East" guidebook she wrote directions to a number of places in Syria that we believe she copied from the Cairo Hotel's copy of the Lonely Planet "Syria" guidebook. Nicole spoke with some guests about these locations earlier in the week and the hotel clerk indicated that on the morning she disappeared, she asked for directions to the "Beehive Houses", a local sightseeing destination, as well as Qasr Ibn Wardan (a nearby castle). No one at these locations recalls seeing Nicole (and they are not heavily visited) and the Qasr Ibn Wardan logbook has a record of only one visitor, Amin Ben Yahia, a person of interest to us (b. 1984, Algerian/Swiss nationality, father is Abbas, mother is Monica) in hopes that he remembers something unusual about that day. UPDATE: On January 19th, 2019, Amine contacted me. He does not remember anything unusual. Nicole preferred taking local transit, but none of the minibus drivers or locals remembers seeing her. As a foreigner, Nicole stood out in all of Syria, but particularly in Hama where the majority of women in Hama dress in robes and cover their hair. The streets from the hotel to the minibus pick-up are main streets with lots of people, even at 8:30 in the morning. 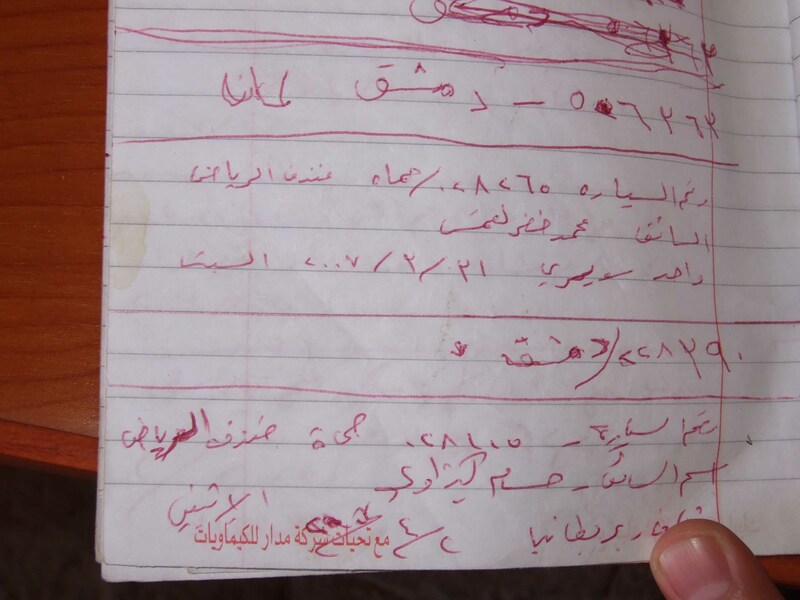 In May 2007, I flew to Syria with Nicole's fiancé Gary to re-trace her steps and meet with police and local officials. Gary spent an additional two months criss-crossing Syria searching for clues. My mother joined Gary in Syria in July 2007 and met with the Grand Mufti as well as the Minister of the Interior. She also made a personal plea on Syrian television and we put ads in the newspapers and local flyers. Gary and my mother returned to Syria in April 2008 to raise awareness and follow up on leads with officials and the police. My mother returned to Syria with Gary for a third visit in March 2009 and we continue to work with Syrian government and police officials on the investigation. There is up to 2,250,000 Syrian pounds ($45,000) in reward money for information leading us to Nicole. We are currently looking for other guests at the Cairo Hotel in case they spoke with Nicole. A list is at the bottom of this page. From the "official" website, you can also submit anonymous tips, view the picture gallery and download posters and Nicole's notes. Arabic versions of most pages are also available. All comments and emails, public and private, are read immediately, but unfortunately I cannot respond to everyone. Feel free to respond in any language that you're comfortable with, though all of my responses will likely be in English. Today marks five years since Nicole disappeared from the Cairo Hotel or in the vicinity in Hama. Despite five years of searching, we really have no new clues as to what has happened to her, though we strongly suspect one of the hotel staff was involved. Syria today is very different from Syria of five years ago. There are certainly no tourists in Hama anymore, and there probably won't be any going there in the immediate future either. Hollywood tells us that stories always have an ending, but unfortunately that's just not true. In those first few weeks we were so confident we'd figure out what happened. And then as each lead dried up the worry in the back of our minds increased, "what if we never find her?". That has turned out to be the case and we may end up being one of those families still searching 20 or 30 years later. You can never really give up. An old friend of Nicole's has been putting huge amounts of effort into finding her. He's been posting on Twitter and updating a blog with details. You can read some updates here, here, and here. Other people continue to offer suggestions and take action. It is very difficult to keep up hope after so much time has passed. All we need is one person who knows or suspects what happens to come to us, but they'll probably be in Syria and unlikely to have access to us anymore. Hopefully one day. "Civil unrest and demonstrations have been occurring in many Syrian cities since March 2011. There has been extensive use of force by the security forces and military in suppressing demonstrations across the country. Many casualties and fatalities have been reported and protests and violent repression are likely to continue. Security operations have involved the complete lock-down of entire towns for periods varying from a few days to a few weeks. This may take place with little warning." Needless to say, our hopes of getting any information about what happened to Nicole have diminished greatly in the short term. Syria continues to be in the news as world opinion is slowly being swayed by the stories of what is happening. Once again, no progress on our search as we approach nearly five years since Nicole went missing. To think that at first I thought this could be resolved in five days or at worse, five weeks! Another month of chaos in Syria. In early 2011, the violence in Syria wasn't making the international news very frequently, but that has certainly changed. It is not surprising that we have heard nothing from Syrian officials, Canadian embassy officials, or our own contacts within Syria. This makes it difficult to move forward in the search. Current Music: Gerard McMann - "Cry Little Sister"
WOW, this is a great idea. will help Matt and his family in their search for nicole, I will donate for sure. I sent you an E-mail few min. ago, and will send you another one within few hours with more contacts regarding newspapers and TV contact there. PLEASE PLEASE PLEASE DO NOT PUT ANY INFORMATIONS YOU ARE NOT SURE ABOUT. First the person talking about the two dead bodies found near the city of Homes do not match Nicole at all. Could you please be more careful of what you write?? One of them was wearing a dark yellow running suit and the other was pregnant. So you people don't go throwing things you hear or you read without making sure. We never beg anyone to go to his country man. You know why? Because no one stands on our nick and our head is always raised and if you begged to go to America that does not mean that there are some people who are like you. And let me tell you your response was really stupid. At the end you live in a democratic country so this was just a opinion don't get mad and reply. I'm the one who wrote about the two found bodies. First if it was my sister who was missing, I will confirm with the authorities about the identities of those bodies and don't rely on some discription on the newspaper...second, what do you mean that one of the bodies was wearing a different suit.!!! thats a naieve comment my friend! simply think if at any point she or anybody else change that suit..
Just calm down everyone, this is a tense situation and we can all get a bit emotional when discussing it. Everyone has good intentions insha'allah - those offering to help AND those trying to advise on possible scammers. Matt, is there any way to have the syrian police do some kind of forensic analysis on Nicoles room just to rule out the possiblity that something could have happened there (maybe another traveller staying there or something). How about search dogs? I know that Turkey has search teams (I think anyway) but I have no idea if Syria would. Can they sniff her clothes and then go around areas she might have been in? The problem with examining the room is that it's been 40+ days since she stayed there and they've rented it out many times since (and hopefully cleaned it) so there's not likely to be much conclusive evidence. This is one of the reasons we needed to know about her disappearance within days, not weeks. Apparently Syria does not have search and rescue teams as we understand them. I have a friend who works with Search and Rescue who knows a team willing to fly over there, but we're saving that as a later option due to the many difficulties involved (eg. I believe it's an American Search and Rescue team) and the wide area that would need to be covered. It has also rained since March 31st. I am a Canadian-Syrian and I have an oilfield service company in Syria. Consequently, my work is in the rural areas of Syria and I know many people and tribes in that areas. I just learned about the story through Syria News. I would like to offer my help by starting checking around that area with the help of my friends there. Please let me know if you have any extra leads which might be of good help to us. i am syrian live is syria , I would like to express my sympathy with you and your family, I wish that she come back home safe and sound. I know that it is very hard, I feel that she is a member of my family, and I would like to help if I can. I can tell you that syria is one of the safest countries in the world , and such problems never happened before. but I would like to ask you if you made sure about the weather in the day she left the hotel , because as I heard that there was heavy rain few weeks ago in the desert. we are all a human been and only the people who don't have heart maybe will hurts her but I think she is protected by the power of god , I am sure that she is fine and hopfuly she will appear very soon, from my side I am going to pry for her. and pry to god to let some good people find her and keep her in safe. syrian family loves the god . We, Syrian people, express our sympathy and support to you, the family and friends of Nicole, and hope she is back home soon. It is unusual at all that such things happen in Syria. Syrian people are concerned and worried about her. I am very sure that Syrian police and Syrian people will spare no effort to help. We pray and look forward to hearing good news about her. I myself have spread her story among all my contacts in Syria and asked them to spread it out so maybe somebody can help. I am syrian canadian ,nowadays living in damascus.I would be pleased to help you in any way you find it useful to find your sister. I pray to ALLAH (mighty God) that she will return home safe . my sympathy for you and your family!